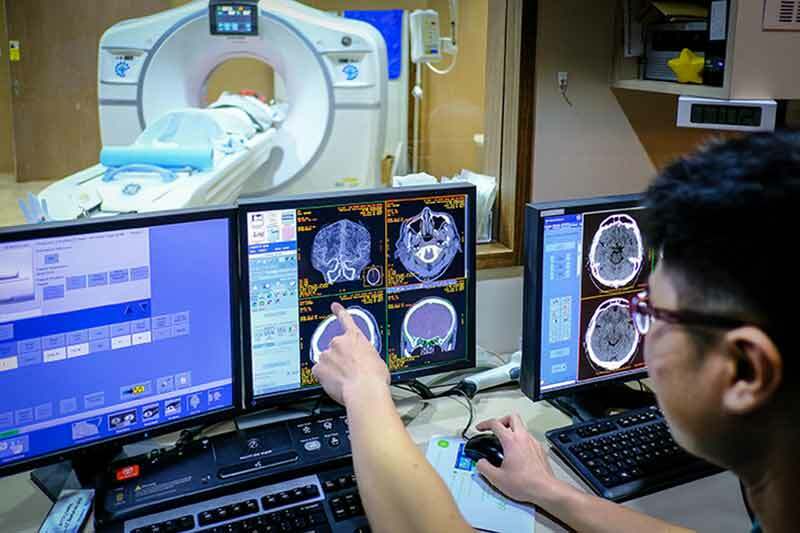 The National Neuroscience Institute (NNI) and Nanyang Technological University, Singapore (NTU Singapore) announced a collaboration to develop innovative technologies to better diagnose and treat patients with neurological conditions such as Parkinson’s disease and brain injuries. The projects for the first year of fellowship include the development of artificial intelligence systems to accurately identify types of traumatic brain injuries from computed tomography (CT) scans and to precisely identify tissues during bran surgeries. Traumatic brain injury, commonly known as head injury, is a leading cause of disabilities and deaths in adults below 40 years old in Singapore. Head injuries can occur after traffic accidents, falls, fights, sports and recreational injuries. Every week, the National Neuroscience Institute sees 20-30 patients with traumatic brain injuries being admitted. CT brain scans are used to check for any intracranial haemorrhage or bleeding that occurs inside the skull, which could require surgery. The scans need to be interpreted quickly and accurately by trained doctors to ensure patients have the best outcomes, as delays of a few minutes can mean the difference between a good and a poor outcome. The success of artificial intelligence computational algorithms in the field of decision-making in complex games, and in image classification tasks can potentially be translated into classifying radiological images, such as those from CT brain scans. In this proposed study, a machine learning algorithm will be trained and applied to differentiate between CT images of different patterns of intracranial haemorrhage. The aim is to develop a rapid, accurate and automated process for reading CT brain scans to reduce the time needed to initiate treatment. Parkinson’s disease is a chronic and progressive neurological disorder that primarily affects a patient’s movement and ability to walk. It is also associated with mental health conditions such as depression and dementia. Three out of every 1,000 people aged 50 years and older have this disease. Deep brain stimulation is a surgical procedure to implant a medical device in the brain. The device sends electrical impulses to specific targets in the brain, changing brain activity in a controlled manner and blocking abnormal nerve signals that cause symptoms such as tremors and movement difficulties. Deep brain stimulation has been performed routinely for suitable patients from the NNI. For such procedures, a neurophysiologist uses electrodes to determine a target area in the brain. The neurosurgeon then implants the device in that location. This project aims to help doctors identify the location for the implant more precisely through machine learning. From analysing large amounts of data transmitted by the electrodes, machine learning can discover patterns that were previously not apparent and determine more precisely, sections of the brain controlling critical functions such as movement. This collaboration aims to groom multidisciplinary scientists, by providing students with first-hand exposure to various aspects of clinical medicine by interacting with neurosurgeons in the course of their work. Over the next three years, the collaboration will foster closer working relations between medical practitioners and engineers through annual fellowships and student attachment programmes. Managed by NTU’s Institute for Health Technologies (HealthTech NTU), the one-year fellowship programme will see up to two neurosurgical residents at NNI work full-time with NTU professors on campus. Each resident will receive S$100,000 to complete and commercialise their projects. A student attachment programme that spans a few weeks will also be introduced, allowing NTU engineering students to work alongside neurosurgeons at NNI. NNI is the national specialist centre and regional centre for clinical referrals for the management and treatment of the neurosciences, as well as for education and research conducted in the field.